Do pain on the edge of your nail? Have you tried to cut down the sides of your nails? Is there a red mass growing out from the nail edge? If you answered ‘yes’ to any of these questions, you may have an ingrown toe-nail, This is a problem that is relatively simple to treat and is frequently managed by podiatrists at Northern Foot Clinic. An ingrown-toe occurs when a sharp edge of the toe-nail (a nail spike) penetrates into the adjacent skin. A nail spike can develop if the nail is cut incorrectly and then, as the nail grows, it slowly penetrates the skin and causes a great deal of pain. Some people are just a bit unlucky, as their nails are excessively curved and this factor alone can lead to an ingrown nail. As the nail spike penetrates the adjacent skin, bacteria enters the skin causing a skin infection which creates more pain because the toe becomes swollen. To treat this effectively, the nail must be removed from the skin. What will podiatrists at Northern Foot Clinic do? How does the podiatrist treat the ingrown toe-nail? Other times, the podiatrist will administer a local anaesthetic to remove 'feeling/pain' and then the nail spike to cleared. The podiatrist may also suggest the application of a special medicament the prevent nail edge from returning. This is a low-grade surgical procedure that is undertaken using local anaesthetic. This procedure is not as invasive as to require stitching/suturing and there is not usually any significant pain after the local anaesthetic has worn off. Unfortunately ingrown toe-nails do not resolve without intervention, in fact they usually get alot worse. When left for months, we often see the development of a red lump call 'hypergranulation' tissue which often bleeds spontaneously. 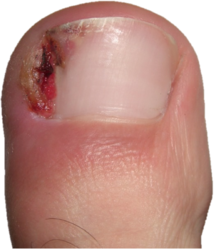 Patients who ignore their ingrown toe-nail often develop repeated bacterial infections. Where can I find more information about ingrown toe-nails?